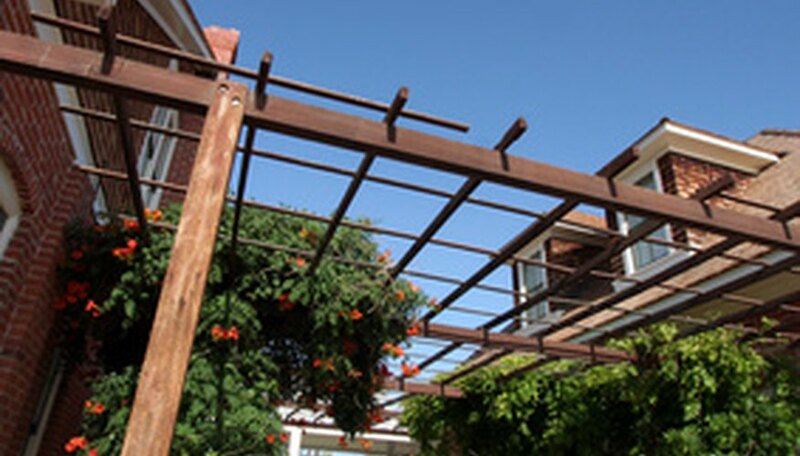 Trellis plants can provide privacy, shade and beauty. Some trellis plants are flowering, while others bear fruit or decorative leaves. Most require very little care with the exception of watering and trimming. Most varieties twist around the poles and trellis supports, anchoring themselves, but wiring or staking the plants can train them to grow in a particular direction. American bittersweet (Celastrus scandens) is a twining vine that attaches itself to the trellis. It takes two years to become established but grows vigorously after that. Pruning the dead vines in the spring causes new shoots to become more prolific. The plant twists around the trellis from left to right. Do not force the vine to grow in another direction or it will fall off the trellis. 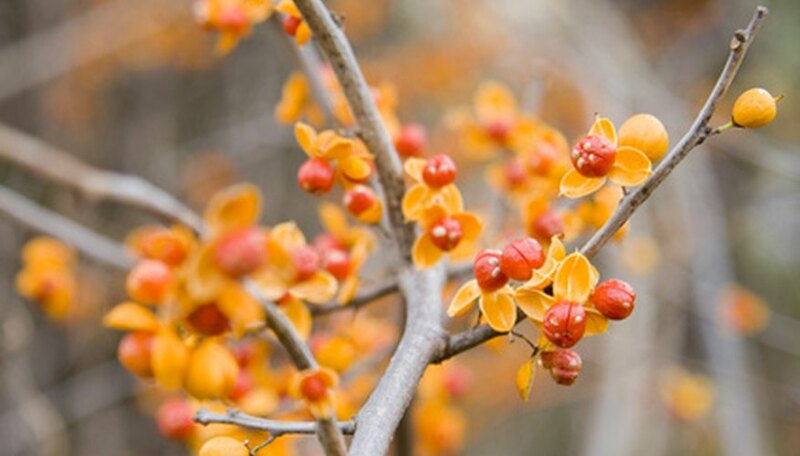 American Bittersweet produces attractive bright orange berries in the fall. The berries remain colorful throughout the winter months. The plant grows in both sunny and shady areas but bears the most berries if planted in a sunny spot. The vine is widespread in most of the United States east of the Rocky Mountains but flourishes anywhere in Hardiness Zones 3 to 8. Dropmore scarlet honeysuckle (Lonicera "Dropmore Scarlet") is a twining vine that produces scarlet-red tubular flowers. The fragrant, bright flowers attract hummingbirds throughout summer and into the fall. The vine grows 6 feet per year, reaching up to 20 feet at maturity. The vine grows well in partial sunlight. This decorative trellis plant is an excellent choice for northern gardens in Zone 3. John Cabot Roses are climbing roses, making them an excellent choice for a trellis. This rose has tendrils for gripping the trellis and needs to be trained to climb the trellis posts. The John Cabot rose is hardy, resistant to disease and grows up to 9 feet. The roses are large, fragrant and deep pink in color. The stalks produce clusters of blooms from early summer to the first frost. The John Cabot rose was bred to withstand cold winters and grow well in New England, as well as Zones 2 and 3. The common morning glory (Ipomoea purpurea) is an annual flowering vine that lives for only one growing season. There are over 1,000 morning glory species that offer a wide range of choices for trellis planting. 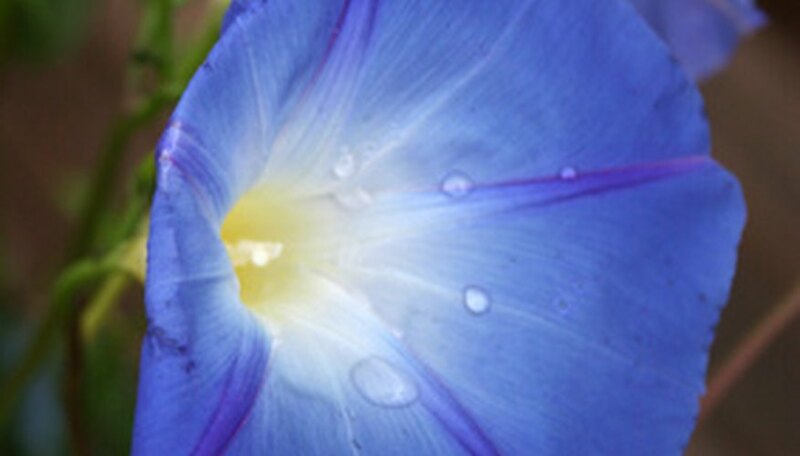 The common morning glory blooms are funnel-shaped, deep-blue, pink, red, purple or white flowers that open in the morning. The morning glory quickly matures and flowers after planting the seeds at the base of the trellis in early summer. The plants do well in full sunlight and tolerate dry weather. Grapes are the most common fruit for growing on a trellis. The trellis must be sturdy because grape vines are thick, the leaves are large and bunches of grapes are heavy. Train the grape vines by wiring them to the trellis. Select the strongest new vines to grow up the trellis.